The wooden breast condition (WBC) is a muscle abnormality observed in chicken breast meat (Pectoralis major) that is an emerging challenge to the poultry industry. Breast meat with the WBC is characterized by diffuse areas of hardness and overall muscle rigidity. Although the WBC is closely associated with fast-growth rates in broilers with high breast meat yield, the specific causes of the myopathy are unknown. Histological studies show that WBC muscles exhibit moderate to severe polyphasic myodegeneration, fibrosis, lipidosis, and perivenular lymphocyte accumulation. Composition analyses indicate that WBC breast meat has higher levels of moisture, fat, collagen, calcium, and sodium, but lower amounts of protein compared to normal breast meat. Genomic, proteomic, and metabolomic studies have shown differences in WBC fillets related to muscle hypoxia, oxidative stress, intracellular calcium levels, protein degradation, cellular repair, fibrosis, and glucose utilization. These findings suggest that fast growth rates in chickens may be related to reduced capillary density, altered cation regulation and carbohydrate metabolic pathways, and increased metabolic stress within the muscle tissue, causing the WBC. Fig. 1. Raw and cooked chicken breast meat (pectoralis major) with the severe woody breast (WB) condition. The WBC disorder is emerging on a global scale and the incidence rate could be up to 50% of a flock. Published data show that WBC negatively affects meat quality and functionality. Breast meat with WBC has significantly higher pH and appears yellower, likely due to reduced carbohydrate metabolism and increased fat content in muscle. WBC meat losses more water during storage and cooking, which is thought to be related to the reduced muscle protein content and an increased proportion of extra-myofibrillar water within the muscle. Meat with the WBC does not perform as well as normal meat during marination and further-processing. Breast fillets with the WBC are often downgraded and sold at a discount, used for further processing, or in extreme cases discarded. It has been estimated that the WBC and white striping (another abnormality associated with chicken meat) could result in an excess of $200 million per year lost. Both raw and cooked WBC meat appears differently from normal breast meat (Fig. 1). Palpable hardness and rigidity are typical properties of raw WBC meat. However, palpation is subjective and is not able to provide specific texture descriptions of breast meat. It is also unknown if the WBC, which is subjectively determined in raw fillets, results in altered texture attributes in cooked breast meat. Several instrumental methods are being evaluated as tools to fully characterize the texture properties of meat. 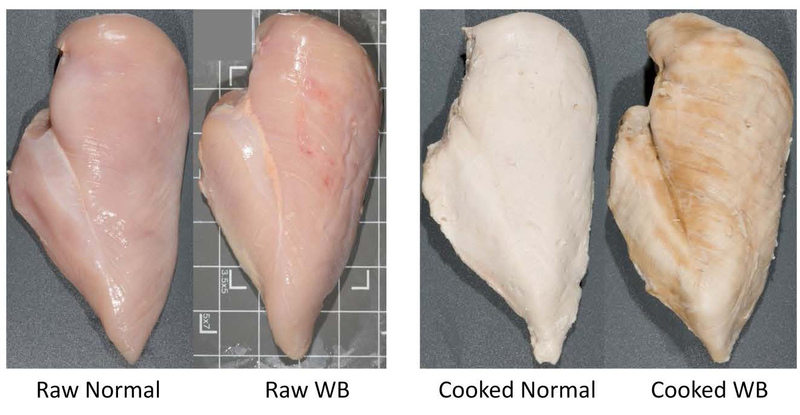 In this study we selected broiler breast meat based on severity of the WBC and measured shear resistance (Meullenet-Owens Razor Shear method) and hardness (compression method) in both raw and cooked meat. Fig. 2. Compression force (kg) and shear force (N) of raw and cooked chicken breast meat (pectoralis major) with the woody breast condition. Our results (Fig. 2) showed that for both raw and cooked breast meat, shear and compression force of WBC meat, regardless of WBC severity, were significantly higher than that of the normal meat. There were similar relationships between the severity of the WBC and the texture measurements for both instrumental methods. In addition we also found that these relationships were not affected by freezing storage. 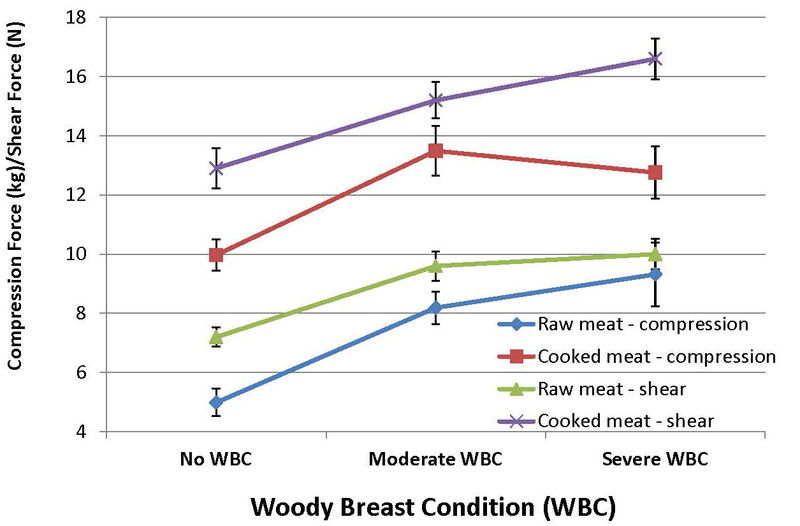 These results demonstrate that WBC significantly affects hardness and shear force in both raw and cooked breast meat. Since there is close positive relationship between meat shear force and a consumer’s perception of meat tenderness and compression force mimics the conditions to which the material is subjected throughout the mastication process, our results indicate that texture of cooked WBC meat would be perceived differently from that of cooked normal meat. Cooked WBC meat is less tender and requires more force to chew through its muscle fibers than cooked meat without the WBC. Instrumental texture characteristics of broiler pectoralis major with the wooden breast condition.